The charm and tranquility of Bavaria. The peace and restfulness of the Northwoods. Welcome to a world away. Built in the 1920s as a private retreat, Garmisch has operated for decades as one of the Cable area’s premier resorts. Here, nestled among the hardwoods and tall pines on a quiet bay of Lake Namakagon, you’ll find private guest cabins, comfortable lodge rooms, a classic Northwoods lodge and full service restaurant and bar. After a few days at Garmisch, you’ll notice that the pines are taller, the pace is slower, and you’re a little more relaxed. We’re well back from the paved town road, and nearly all of the adjoining and nearby land is part of the Chequamagon National Forest. In fact, most of the bay on which Garmisch is located will remain undeveloped forever. Along with the solitude, however, you’ll still find a rare sense of community and camaraderie. Many families return year after year; they look forward to making new friends and getting reacquainted with old ones. Garmisch offers you a chance to get away from it all, and yet still be part of a northwoods community like no other. The architecture is Old World, hand crafted by local artisans. 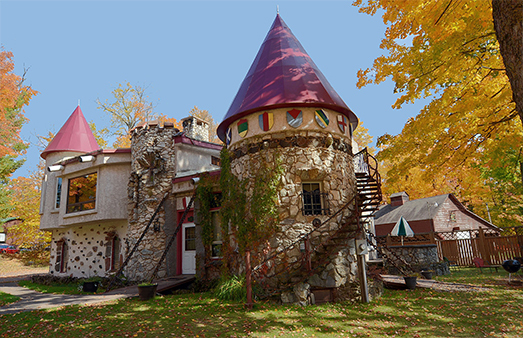 The main lodge and many of the guest cabins date back to the 1920s when they were built as a private vacation retreat for a wealthy Chicago family. Lodge rooms are uniquely charming, each with its own bath and many with warm fireplaces and breathtaking views of Lake Namakagon. 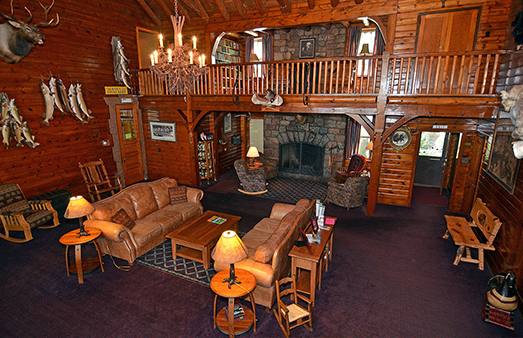 Cabin rentals are spacious individual buildings complete with kitchens, fireplaces and individual bathrooms for each bedroom. They range in size from one to five bedrooms. Each is as different as the mood created by their names – Geneva, Blarney Castle, Edelweiss, Alpine, Rhinelander, Chateau, Squid, Schwaben, Frog, Zugspitze Inn, Bug, Bean, Hochwald, and the Grub. Located on the shore of Lake Namakagon the main lodge also houses a restaurant and Bierstube Lounge serving breakfast, lunch and dinner. 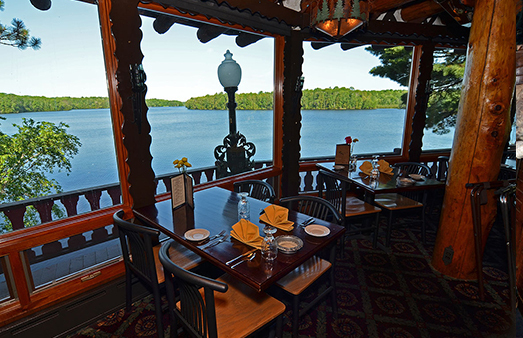 The spectacular lake view provides the perfect setting to enjoy your favorite steaks and seafood or their increasingly popular German cuisine with that special someone or with the whole family. The Bierstube Lounge/Bar offers all your favorite refreshments and a lighter food menu. Beautiful Lake Namakagon, one of the best all-around fishing lakes in Wisconsin, provides the back-drop for sports activities that are an impulse away. In summer, enjoy hiking, canoeing, fishing, boating, pontoon rides or swimming at the sandy beach. Fall brings the legendary colors of the northwoods and the best in hiking, hunting and fishing. In winter, experience snowmobiling or skiing on the best trails in the world. Springtime offers quiet opportunities for hiking, bird-watching, exploring the Chequamegon National Forest and relaxing with family and friends.